As if drivers in the west end of Montreal haven’t faced enough commuter calamities in recent years, another roadblock is coming to Angrignon Boulevard — ensuring about 12 months of congestion around the Highway 20 interchange. 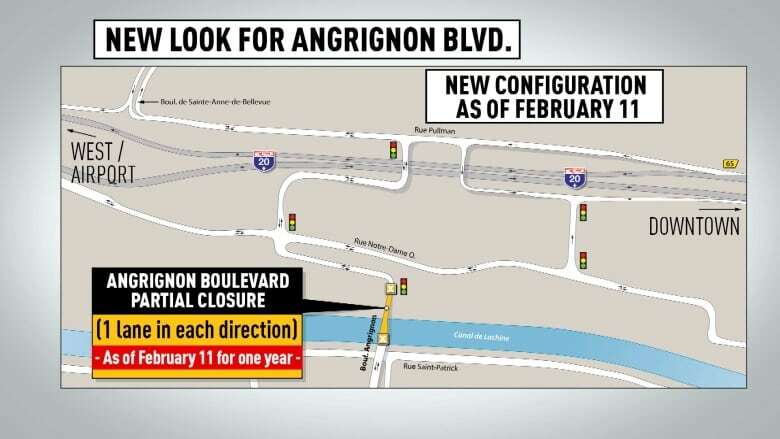 As if drivers in the west end of Montreal haven't faced enough commuter calamities in recent years, another roadblock is coming to Angrignon Boulevard — ensuring about 12 months of congestion around the Highway 20 interchange. Starting Monday, the normally four-lane bridge over the Lachine Canal, which provides access to Highway 20 and connects LaSalle to NDG, will be cut down to one lane per direction. As part of the Turcot Interchange project, the bridge will be demolished and replaced in the coming months but, to prepare the already traffic-clogged area for the new configuration, there will be several closures throughout the weekend. For starters, Angrignon Boulevard will be completely closed from St-Patrick Street to Highway 20 from Friday at 10 p.m. to Monday at 5 a.m. The Angrignon entrance for Highway 20 east will also be closed during that time. Five kilometres of Notre-Dame Street West will be closed between Dollard Avenue and St-Rémi Street. Notre-Dame Street West will be closed between Monk Boulevard and Carillon Avenue until Feb. 18. "All these closures are very important to put in place the new configuration," said Transports Québec spokesperson Martin Girard. Girard recommends drivers ditch their cars in favour of public transport, or carpool to reduce congestion. If driving is necessary in the area, he said people should check the map for alternate routes before hitting the road. "It will be very important they plan their trip, to try to find another way to move around," he told CBC on Friday. "When it's possible, use public transportation." Though unrelated to the project in LaSalle, there will be other traffic-causing detours all weekend. Highway 15 northbound will be closed from 11:59 p.m. Friday until Monday at 5 a.m. between Exit 58, which heads downtown, and the onramp at Gaétan-Laberge Boulevard. There is another closure between Vérendrye Boulevard to the Turcot Interchange during that time. As for southbound, the highway will be closed between the Turcot and Atwater Avenue between 10:30 p.m. Friday and Monday at 5 a.m. Detours will vary depending on vehicle type, with most directed to Highway 720. De la Vérendrye Boulevard will also be closed in the eastbound direction between Galt Street and Highway 15. A detour will be via Galt Street south. The entrances to De la Vérendrye Boulevard and St-Patrick Street West will also be closed. All these closures around Highway 15 are so crews can continue dismantling the old roadways and make room for the newly constructed network, Girard said.